I don't dislike children - contrary to what some may think. I do dislike it when people are loud and selfish and don't put things away after they've finished with them, and when they insist they know what's going on when in fact they don't. I also have problems with people who make a huge fuss when things don't go their way. The fact that this describes a large proportion of most 'normal' childhood behaviour doesn't seem to bother most people but it's always struck me as odd. Indeed, most adults seem to see it as typical or even healthy and hardly worthy of comment. Why do I feel so differently about it? I had a pretty good childhood back in the sixties and seventies by most standards. I was pretty content as long as I had some paper and pencils or plasticine or Lego to play with. I was mostly into dinosaurs. I had full and complex relationships with my cuddly toys. I spent hours hunting wildlife (mostly slugs and beetles), digging holes and building camps in the garden - a wilderness of nettles, brambles and raspberry canes and other miscellaneous junk. The soil was full of broken glass from a wrecked greenhouse but I hardly ever cut myself and never seriously. I never played on the lawn. Both the house and the garden were pretty immense by today's standards so it was easy to stay out of sight. I had collections of stamps, seashells, Airfix models, and then tropical fish and house plants (which got me into gardening just before I left home). I spent hours down on Kingston Beach hunting marine life. It was just across from the end of the road. I knew all the little twittens and wasteland around the town and then as I grew I spent a lot of time over the harbour and I walked and cycled as far as Steyning and Ashington. I looked at my dad's books (non-fiction - mostly wildlife) and listened to his music (from Louis Armstrong to Holst, from Westside Story to Tubular Bells). We had cheap camping holidays and big family Christmases. We didn't have a telly for years. Don't assume from this that I come from a posh background. My dad was an electrical fitter and shop steward at the power station, like my mum's dad before. My dad's dad was a lorry driver amongst other things, and they were all from around Shoreham. Mum did home help and bar work. The big house on Victoria Road, Southwick was cheap because it was a mess. At the time it was cold and dusty and decidedly eerie at night. It was not an attractive house. Back then there was no housing shortage and everyone wanted the new bungalows on the Downs behind Shoreham. Dad fixed the whole thing up himself (with help from friends and relatives) because we couldn't afford to pay plumbers and electricians and carpenters. He learned to do everything himself. Today a three storey, four bedroom house with a lounge and a dining room and a conservatory and probably a third of an acre at the back would be a different matter. Nowadays you'd pay the better part of half a million for it, pull it down and start again. And don't imagine that Southwick was a picturesque idyll. It has a rather impressive village green and some very venerable buildings near by, but the bulk of the town is fairly anonymous. Travelling from Brighton to Worthing along the coast road you'd hardly know it from all the other places along there - Hove, Portslade, Fishersgate, Shoreham and Lancing. 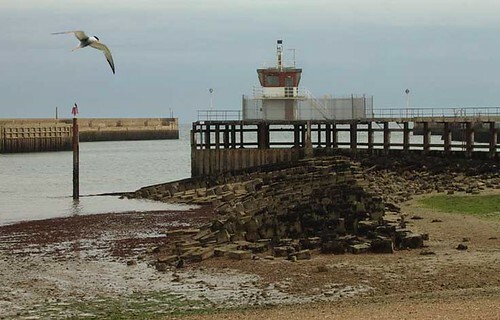 Kingston Beach, which lies within Shoreham Harbour, is a mud flat at low tide with only shallow muddy pools among the pebbles and rubble. There was a remarkable variety of life down there none the less. Back then, without a property boom, demolition sites could sit empty and grow weeds for decades. I hunted grasshoppers and lizards among the rubble and played jungles in the Buddleia and Japanese Knotweed. It's unimaginable now that a child as young as seven or eight would be let loose in that environment, but I was. I don't think I ever had a major accident. I was very careful. I knew my limitations. One day a man stopped his car near me in Southwick Square and asked me to get in. I simply said no and walked away. Mum had told me, if a stranger spoke to me to go into a shop. Most of the time I remember I was left to my own devices. I don't remember particularly being lonely or feeling neglected. Sometimes I envied my younger brother because he always had friends around, but then, if he didn't have company he didn't really know what to do with himself. I on the other hand rather resented people interrupting and interfering. I don't ever remember being deliberately naughty or mischievous. With my family there would have been little point in pushing it so I didn't try. They were not nasty about it - just firm. There would have been no point arguing. I did not live in fear though. I learned to be sneaky. My mum was somewhat anxious and controlling so it was best simply not to ask permission. She preferred not to be distracted from doing what she had to do so it worked both ways. My brother and I never really felt the need to fight and my parents never rowed so we weren't used to raised voices in our house and I still hate to hear people arguing. When we visited friends and relatives their children always seemed to be throwing tantrums or sulking. Everything seemed to be a battle for them and I stayed out of their way. I think a lot of that has to do with the fact that I was the eldest by many years of all the children in our family circle. My brother wasn't born until I was three and we therefore had very little in common. All our friend's children came along after that. There was no child care or nursery school so I didn't meet another child my own age until I went to school aged five. That's probably why meeting 'normal' kids was such a shock and something I've never really come to terms with. Who will cast the last stone?